Implementing a new cloud ERP system requires in-depth considerations that go beyond technology. It is a far-reaching, organization-defining event that transforms your current processes into an ERP system built around best-in-class processes. Our Accounting Solutions team takes the time to understand your organization’s short- and long-term objectives and requirements to configure Sage Intacct to work in the most effective and efficient manner possible. We understand that your system needs to be able to adapt to an ever-evolving business landscape. We place an emphasis on delivering a product built to your specifications and built to last. OPTIMIZING PERFORMANCE: Make your team more insightful and more productive. DRIVING RESULTS: Drive growth, don’t just observe it. GAINING SOPHISTICATION: Access anywhere, from any device; easily connects with other solutions. Your needs may change as your business grows, but, with Sage Intacct’s open API and robust Marketplace, you will have the choice of seamless integrations that are all “true cloud” technologies – including payroll, HR, CRM, a driver-based budgeting and planning module, and more. Through our partnership, you gain access to seasoned professionals that have led hundreds of implementations (for start-ups to Fortune 1000 companies) in industries spanning everything from professional services to nonprofits. We bring the best of all worlds to your SMB’s finance operation: coverage on the fundamentals, clarity on complex rules, and cohesion to the process. Our team will help you gain the speed, accuracy, visibility, and flexibility required to take your organization to the next level of financial management. We work with accounting and finance systems but the core of our focus starts with your strategic business objectives—we work inside out from there. We don’t just implement a technology; we build a process that leverages a technology solution. To begin, we review your current processes and agree on a path that that affords you the ability to operate with a level of sophistication previously unattainable using spreadsheets or entry-level/outdated accounting solutions. By leveraging our business process improvement experience, we fine-tune practices that meet evolving needs. We’ve built an implementation framework based on proven methodology that consists of phases, tasks, and key milestones throughout our projects. 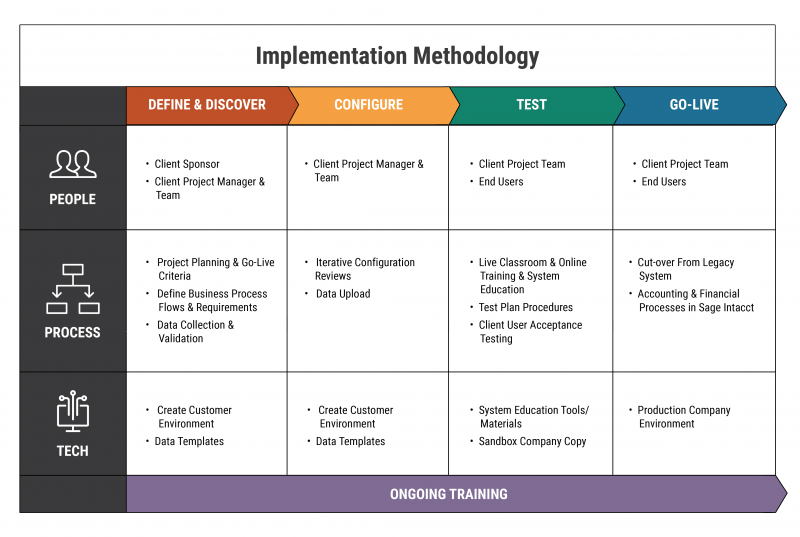 With a plan rooted in definition and discovery, we use the highest-value approach to when implementing a solution tailored to meet your organization’s needs. We understand the impact of transformational finance projects of this nature. When we do our job, it frees you up to do yours. Backed by a tailored approach and depth of experience, we arm you with insights and information throughout the project’s lifecycle to deliver a dependable, long-term ERP cloud solution that suits your business needs and desires.